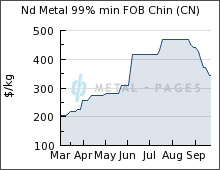 The Price of Rare Earth Neodymium Magnet Prices – A small bubble bursts? At the beginning of this year China, which controls that vast majority of Neodymium production in the world, decided to centralize production. They put taxes on the product to pay for pollution controls (mining and refining can be a messy business) they also controlled exports in order to utilize the magnets for their own ends. This caused a quite a stir as prices skyrocketed and manufacturers of toys and other magnet using products found their materials costs rising rapidly. Many vendors informed us of price increases 2-3 times this year where in past years there may have been just one set of price changes. It also threatened the price of hybrid cars, which use at least a kilogram of Neodymium. But a few months ago, we noted that the price of Neodymium leveled off. It hindsight it should have been fairly obvious – prices can’t increase 100% every month. We went on the assumption that the prices might drop a little bit but would likely remain high as domestic production of Neodymium ramped up and dropping prices might discourage such investments, and China had little reason to change its present policies. However, there were other factors in Neodymium pricing at play. These factors have resulted in a bit of a price crash over the past month. While the price out of China remains high, it has come down quite a bit. But the Bloomberg Rare Earth Metals index has actually dropped below last year’s levels! There are apparently several reasons for this crash. One is speculation – whenever a commodity rises fast in price there are inevitably economic speculators who jump into a buying spree and hold the product hoping to get as much re-sale out of it. This can be quite profitable, but if you join at the wrong time you can get caught in a crash or bursting bubble of prices. It seems that this happened to a lot of speculators when the demand dropped. And why did the demand drop? Well, high prices discouraged a lot of casual use of high-power magnets, but Toyota was working on a rare-earth free induction motor in response to China’s 2010 restrictions. Other car companies plan to use such motors in their hybrids as well. production was at a high point and prices at a low point – this is the era when rare earth magnets started to be used in toys! But at least the era of rapidly skyrocketing prices of rare earth magnets would seem to be over for now. We’ve covered the easiest telescope target in a previous post on viewing the Moon and now it is time to start thinking about using your telescope to view other members of our solar system – the planets. We’ll start with actually can be a harder target in some ways: The inner planets, or at least the ones closer to us. This means Mercury, Venus, & Mars. Most of the planets are bright enough that they are not affected by light pollution much. Viewing them is subject to other atmospheric conditions, however. Mercury – Right off the bat we should let you know that Mercury is a very tough object to view. Being the closest planet to the sun means that most of the time it gets washed out by sunlight. However, every now and then Mercury reaches its furthest orbital distance from the the sun and sticks out far enough so that right after the sun sets Mercury can be seen. This is the best time, in fact the only time to view Mercury (although it can also be viewed when the same orbital conditions happen during a sunrise). Don’t expect very much, Mercury will appear to be little more than a dot in your telescope. Most astronomers usually hunt down Mercury just to say that they have done it rather than for any impressive views. Venus – Venus is also closer to the sun than the Earth, which means it will only be visible right before the sun rises or right after the sun sets. Hence Venus’ other names “Morning Star” and “Evening Star”. Venus will usually be very bright and easy to find when it is up. 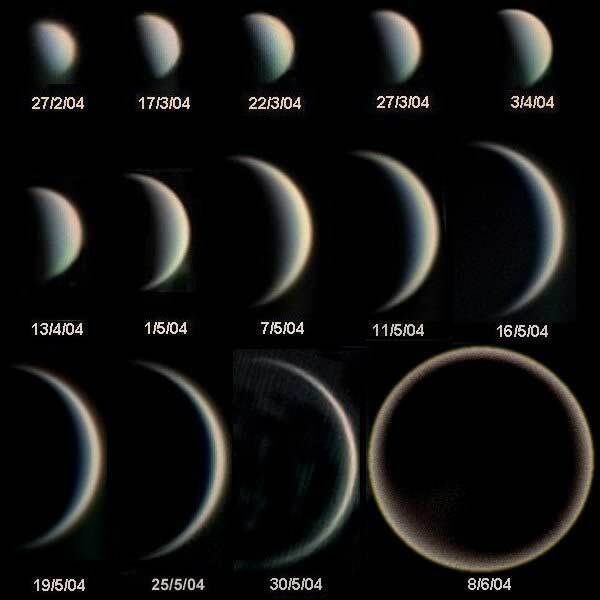 When magnified in your telescope Venus will likely have a crescent shape visible much like the Moon but probably won’t have many surface features, at least without a filter. This is because of Venus’ heavy cloud cover. That same cloud cover makes it very reflective and bright but removes any surface detail. Note than on some occasions, with a bit of experience you can actually view Venus in the middle of the day! This takes some practice to do, however. It is one of the occasions where a computer-aided telescope can actually help quite a bit. Mars – Mars is the first planet that is actually further from the Sun than Earth. It is reddish in appearance -even without a telescope. When it is up you can try to crank up the magnification. Most of the time Mars is a decent object to view, but about every 24-25 months Mars reaches opposition, where it is closest to Earth. 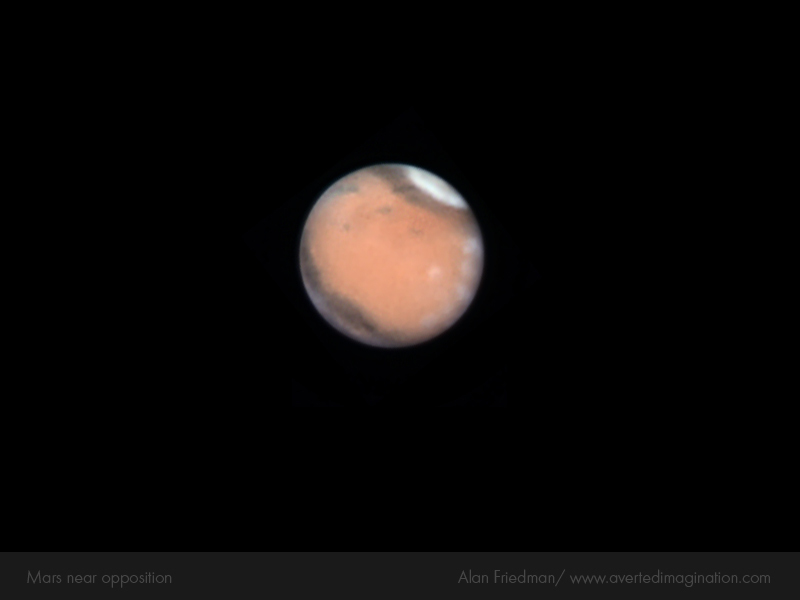 This is best time to view Mars and with decent skies, a good telescope, and high magnification you might be able to get details such as the polar caps! As of this writing the next opposition will be in March of 2012. A note about Mars – Every time Mars comes into opposition some folks send out emails with ludicrous claims about how Mars appear as big as the Moon in the sky. These emails are recycled from the 2003 opposition which was the closest opposition in some 50,000 years. But even during that opposition Mars certainly did not appear as big as claimed. When you get these emails, please do not forward them. Asteroids and Minor Planets – These can be tricky targets and often require a bit of detail and knowledge of the sky to find them. They also require a good quality telescope to locate. Get some experience working with the night sky before you start hunting asteroids. that you can consider using color filters that thread onto your telescope’s eyepiece. These filters can help bring out surface details that would otherwise not be viewable in normal conditions. A Red #25 filter, for example, can bring out cloud detail on Venus. Trying different filters can bring a new experience to your viewing of the planets. In our next Astronomy Hints we will tackle the bigger denizens of our Solar System (well, most of them are bigger anyway)- The outer planets! A fun side-hobby in astronomy is to get quick glimpses of the largest man-made object in our orbit: The International Space Station. 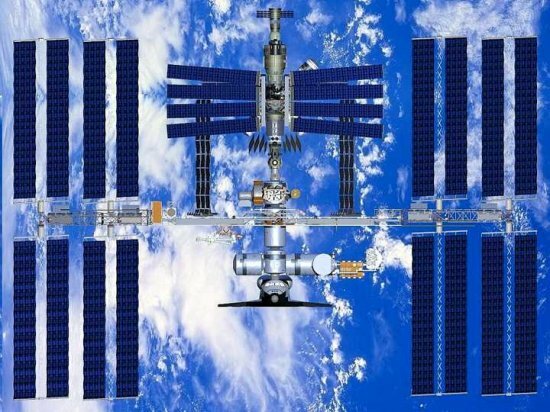 The Space Station is a nifty, bright object from our view. It moves quickly from horizon to horizon and comes up fairly often. But knowing when it will show up is a bit of a problem, especially since its visits are over quite quickly. There are computer programs, Smartphone Apps, and other online aids to help you plan but not much that really helped let you know when it was coming if you weren’t specifically looking for it. Well, here to help with that is TWISST. If you have a twitter account TWISST will send a tweet to everyone in your location when the ISS is going to make an appearance! TWISST uses your entered location on Twitter and makes tweets appropriately! ISS viewing is one of those hobbies that requires no special equipment, you can view many of the ISS passings with the naked eye! All you need is a twitter account and maybe a phone that can get tweets! Bacteria Experiment Kit - Agar! as a bacteria growing medium – happily feeding the source bacteria you swab through it from whatever experiment you’ve dreamed up. Be it the ‘is my dog’s mouth cleaner than mine, to testing the 5 second rule. We’ve sold lots of gelled Agar over the years, in both bottle or kit. But sometimes people prefer to mix their own agar rather than have it pre-gelled. Sometimes this is for storage reasons (dehydrated agar does last longer on the shelf). Also, people may have need for other kinds of Agar or lab mixes. So we have added some new agars and will be adding more! We’ve added a 500g bottle of dehydrated Nutrient Agar, as well as bottles of Technical Agar (which has a much lower amount of ‘stuff’). We’ve also added MacCornkey Agar, which is used in identifying bacteria that can ferment lactose. The MacCormley Agar will be available dehydrated or as a prepared plate. used to determine the effectiveness of bactericidal properties of disinfectants, etc. This comes in convenient tubes in packs of 100. In addition we are now carrying bottles of Butterfield Phosphate Buffer, which is used as a dilutant in wastewater & food testing. These new chemicals, being mostly biological or used in biological applications, are made on demand to maximize shelf life. As a result they cannot be rush ordered. Spectrum Scientifics will be adding more of these items in the future. Keep an eye out! DK Publishing produces colorful, informative, and fun books. But they also produce nifty kits that are one part book, and one part science kit. 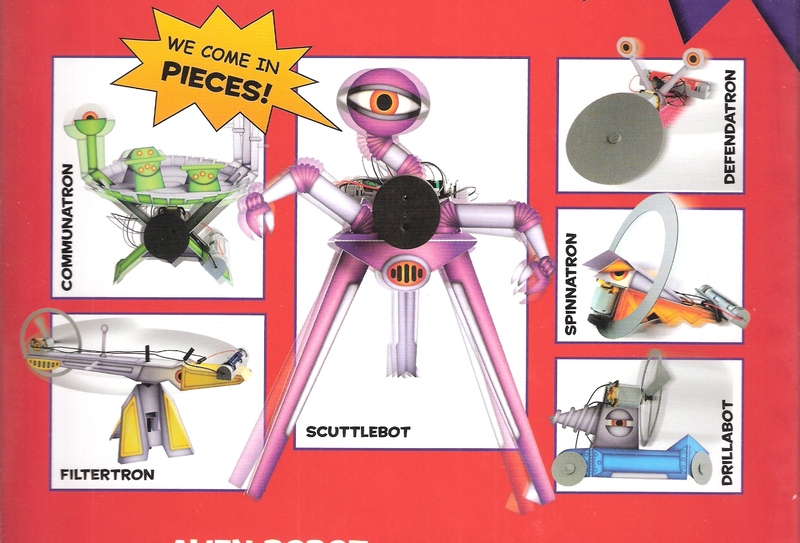 An example of this was their recently released Alien Robots Kit and The Science Kit. While kids build the robots, they actually learn about physics, mechanics, motion, friction, gears, and more! Also available from DK is The Science Kit! The Science Kit with included book has enough materials to do over 100 science experiments! Creata a race car, build a helicopter, make a glider, a lava lamp, and much more! Both kits included the needed parts and have a 48 page booklet covering the science and experiments involved. Both kits are for ages 8+. Benchmark Scientific has made a great name for itself by providing low-cost, high quality lab equipment. A good part of their line includes lab rockers that are used for staining, destaining, gentle mixing, or many other purposes. But lab workers demanded something a bit more durable & long lasting. Sure the Benchmark rockers were tough, but scientists wanted them to be able to operate under cold room conditions, in incubators, or just be able to rock 24 hours, 7 days a week for years at a time. And by rock we don’t mean rock like your local radio station. So Benchmark developed the Everlast Rocker 247, the Lab rocker that they are so confident of its durability that they back it with an unprecendented 5 Year limited warranty! The Everlast 247 rocker is designed for long endurance use – it can withstand cold room temperatures (down to 0 degrees C) or incubators (max. 65 degrees C). It can run 24 hours a day, 7 days a week with no problem. The heavy duty motor and system can handle it without a hitch. The rocking speed can go from a gentle 3 rpm up to an aggressive 80 rpm for serious mixing. The tilt angle can be adjusted by the user from 0 to 20 degrees. The platform is durable stainless steel to prevent rusting and corrosion, it can handle up to 16 lbs (7.5 kg). In addition, an optional stacking platform can be added as well. A non-slip rubber mat is included for traction. The optional platform mounts with a 3.5″ clearance. This durable lab rocker will give hard-working labs a tool that goes with their schedule demands.